BSNL has doubled data usages of its popular Data STV to 10 GB which was earlier providing 5 GB data in the same cost for just Rs 549/- with validity of one month (30 Days). It is equivalent to 100% increase in data benefits to subscribers. 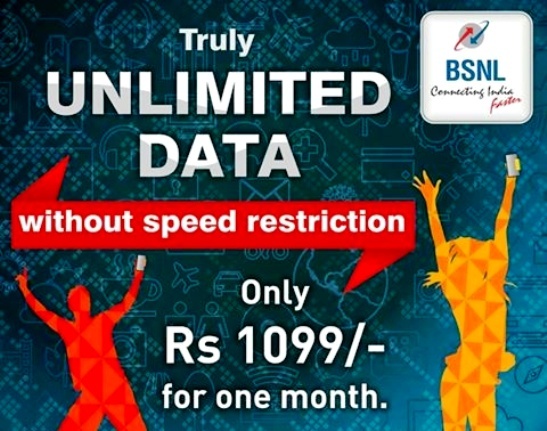 In addition, Bharat Sanchar Nigam Limited (BSNL) has also announced the launch of TRUE Unlimited 3G Data STV i.e.,Unlimited 3G data STV without any speed restrictions for all prepaid mobile customers for just Rs 1099- with validity of one month (30 Days). This is first of its kind in Telecom Industry. Cost effective new data STV of Rs 156/- has also been launched which provides 2 GB data for 10 days. These offers will be available on PAN India basis with effect from 25th August 2016. BSNL is leading in mobile service initiatives by giving unlimited data tariff without keeping any speed restriction by introducing new data STVs in Indian market. Dear readers, please share your views and opinions about the launch of TRUE Unlimited 3G Data packs from BSNL via comments with us. Im from punnapra (alpy) full range bsnl 3g getting speed of 2.7mbps average. On my jio 4g 850mhz 10.2mbps indoor..